As we search the Scriptures to learn what the Holy Spirit has revealed to us concerning God’s investment in the members of The Body of Christ, let us keep in mind that we refer to God the Father, God the Son, and God the Holy Spirit. Let us think of the simple statement of the young Christian who described the Trinity as “Three in One, and One in Three, and the One in the middle died for me.” Christ said to His Father “All Mine are Thine; and Thine are Mine.” (John 17:10). Let us also keep in mind the words of Christ in Luke 12:50, “I have a ‘baptism’ to be bap­tized with; and how am I straitened till it be accom­plished.” You will understand the meaning when we refer to Christ’s ‘CALVARY’ baptism. This was ac­complished on the cross when the eternal, omnipo­tent, sinless Saviour, the Divine Creator of the heavens and the earth, cried “finished.” He then and there suffered for sins, ONCE (not at every mass like Romanists think), the Just for the unjust, that He might reconcile us to God (1 Peter 3:18). By His own blood He ONCE entered into the Holy Place itself, having obtained for us eternal redemption. (Hebrews 9:12). God in human form, by His ‘Calvary’ baptism, was made sin for believing sinners that they might be made the ‘righteousness of God’ in Him. (2 Cor. 5:21). As we read the truth of Ephesians 2:1-10, that God is rich in mercy and great in love, and that with that great Love He loved ‘dead sinners’ (when we were dead in sins), made believers alive WITH Christ (Ephe­sians 2:5), raised them up and made them to sit down in the heavenlies WITH Christ. “YOU, that's right YOU, having been dead in your sins, hath He made alive together WITH Christ, having forgiven you all trespasses.” (Colos­sians 2:13). In Romans 6:13, Colossians 2:20, and Colossians 3:1, we learn that Christians are “alive from the dead”; but they are “dead with Christ,” and “risen with Christ” to seek those things which are above. When the believing sinner receives Christ and becomes the beneficiary of Christ’s ‘CALVARY’ baptism, God, for Christ’s sake, forgives him all His sins (Ephesians 4:32), and he is justified FROM all things (Acts 13:39), justified FREELY, mind you, by God’s Grace, through the redemption in Christ Jesus. (Romans 3:24-26 and Romans 4:5). He has eternal life and shall never perish, or be separated from the love of God in Christ Jesus. God would have every human being know that a ‘dead sinner’ does not become a ‘living saint’ by what man does for God, but by what God, the Father, the Son and the Holy Spirit does for man. “Not by works of righteousness” (Titus 3:5); “not of works, lest any man should boast” (Ephesians 2:8-9), “not according to our works, but according to God’s purpose and Grace” (2 Timothy 1:9). When the Child of God is saved by the Gospel of Grace he is im­mediately sealed and indwelt by the Holy Spirit, sealed unto the day of redemption. 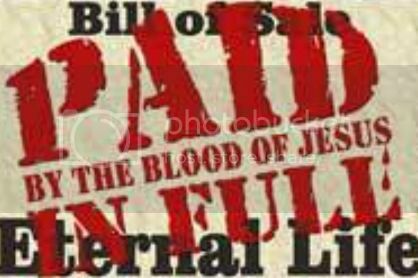 The Holy Spirit indwelling the believer is the earnest, or down payment, of his inheritance until the redemption of the purchased possession. (Ephesians 1:13-14 and Ephesians 4:30). “After that ye believed” (Ephesians 1:13) is “pisteusantes,” correctly translated “believing,” meaning “when ye believed.” The Lord expects His redeemed children to walk in the Spirit by the power of the indwelling Holy Spirit, and thereby fulfill the righteousness of the Law of the Spirit and manifest the fruit of the Spirit. (Romans 8:4 and Galatians 5:23-25). At the time the Child of God is saved and sealed he is baptized by the Holy Spirit, (not by man with water), INTO the Body of Christ. (1 Corinthians 12:13 and 2 Corinthians 1:20-21). God is making of believers, both Jew and Gentile, without distinction, ‘ONE NEW MAN’, by reconciling them unto Himself in ‘One Body’ by Christ’s ‘CALVARY’ baptism. (Ephesians 2:15-16). The LORD Jesus Christ's will is that there be no division in the ‘ONE BODY’ of 1 Corinthians 12:25, Romans 12:4-5, and Ephesians 4:4-5. In Ephesians 3:6 this ‘ONE BODY’ is called “Joint-Body,” which means that God’s Ekklesia now, made up of both Jew and Gentile without distinction, in this Dispensation of Grace, is a Spiritual Organism rather than a religious organization. Now get this...There are NO unsaved people in the Body, the Joint­-Body, of Christ. All the truly saved people are in this Body and are members one of another, but all ‘One Body’. (Romans 12:4-5, Ephesians 2:21-22, and Ephesians 4:15-17). The Holy Spirit through the Apostle Paul wrote, to Body of Christ members, warning them of the subtlety of Satan and of his tricks or wiles (Ephesians 6:13-20). Satan is the real enemy of Christ, and also of the true Church, because Christ and the Church are ‘One Flesh’, Head and Body. (Ephesians 5:31-32). Then, at the appointed time, once the last member of the Body of Christ has been added and this Dispensation of Grace is brought to a close, Christ will suddenly appear from heaven to give glorified bodies to His redeemed Body-mem­bers (Philippians 3:20-21). Note in Ephesians 5:25-27 one reason why the Lord Jesus suffered His ‘Calvary’ baptism and note the glorious future of the Body of Christ. “That He might present It to Himself, a glorious Church, not having spot or wrinkle; but that It should be holy and without blemish.” Therefore, it is the will of God that every Body-member should re­ceive the Spirit of wisdom and revelation in the knowledge of God, that all should have the eyes of their understanding enlightened, and be thus taught what is the meaning of the riches of God’s inheritance in the saints, (Ephesians 1:14-17). The Ekklesia of The Dispensation of Grace, has an eternal glorious future.“ If we suffer with Christ, we shall reign with Him.” (2 Timothy 2:12). Believers will be in heaven because Christ suffered. Body-members are going to judge the world AND angels. (1 Corinthians 6:1-3). Body-members are ‘Joint-Heirs’ with Christ (Romans 8:15-18) and God’s will is that they should be blameless and harm­less, the sons of God, without rebuke in the midst of a crooked and perverse nation, shining lights in the world, holding forth the Word of Life. (Philippians 2:14-16). Living Saints will be rewarded for good works done in the Name of Christ. (Colossians 3:17). Therefore, we can see, God has invested heavily in members of the Body of Christ. After the awful suffering of God’s Son, that Son chose the Apostle Paul to be His suffering apostle, “to fill up that which is behind of the afflic­tions of Christ in my flesh, for His Body’s sake; which is the Church.” (Colossians 1:23-26). Christ appointed Paul to be His ‘head-carpenter’ (‘architekton’ in the Greek)). (1 Corinthians 3:10). The Apostle Paul, the ambassador of Christ, the prisoner of Jesus Christ for Gentiles (Ephesians 6:19-20, and Ephesians 3:1-8) suffered, as a malefactor, for US, that we might know the glorious truth concerning God's Eternal “Grace” purpose. (2 Timothy 2:7-9, Colossians 4:3-4). And NOW, God’s will, during this Dispensation of Grace, is that we, The Body of Christ, might make all Saints see what is “the Dispensation of the Mystery.” (Ephesians 3:2-11).